Staple set brushes feature a series of individually grouped filaments, known as tufts, inserted into holes that have been drilled in a solid block of plastic or wood. When we customize a staple set brush, we first drill a hole pattern into the block. Then, a tuft of fill material is secured into place in each hole using a staple, typically made with steel, stainless steel or brass. Precision Brush can customize the materials, the tuft pattern and hole size to obtain the ideal brush density and brushing effect for your specific application. Your options are virtually unlimited considering our vast selection of brush patterns, filament materials and block materials. 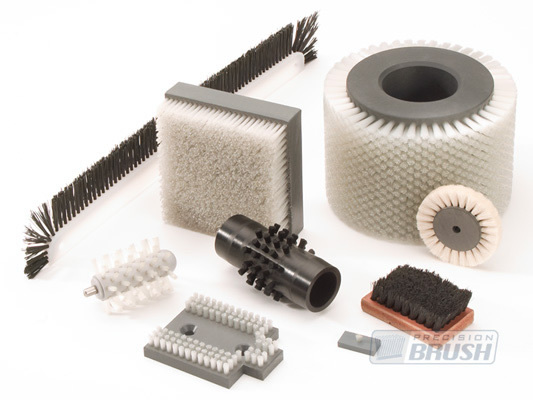 Precision Brush Company offers a full range of fill materials, including nylon, nylon, polypropylene, natural bristle filaments, brass, bronze, stainless steel and abrasive nylon. The block (core) materials most commonly used are wood or plastics, including polyvinyl chloride (PVC), polypropylene, ABS, HDPE and delrin and we can also staple into flexible materials such as leather, flexible polyvinyl chloride and urethane. Flat style brushes are the most common style of staple set brush. The block is rectangular or square-shaped with rows of tufts stapled across the length of the block. Long flat style stapled brushes are commonly referred to as lag brushes. 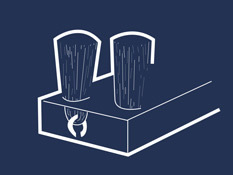 Flat style blocks can also be designed and produced with the mounting holes for easy assembly. The diameter of each hole or tuft generally ranges from .078” to .437”.The hole depth will depend on the diameter of the hole. Generally, the tuft holes are drilled and filled vertically, but for certain applications, the hole can also be drilled at an angle. The hole pattern of your brush can be customized to meet your specific brushing requirements. The two most common patterns for flat-style brushes are a straight or staggered pattern. The brush fill material can be trimmed to your unique brushing requirements. The most common trim style if flat, but there are several trim styles available. Choices include a flat, bevel, convex, concave, step, double bevel, combination step or Chiseled. A cylinder or wheel brush has tufts inserted into a round block, typically made of plastic or hardwood. The plastic or wood core can be press-fit onto a shaft or the internal tube can be made with collars to accept a shaft. The staple set cylinder can also be manufactured with journal ends for mounting between bearings or driving the brush. The internal core construction can be made of steel, stainless steel or aluminum. This core can also be designed to accept press-fit bearings. The most common pattern for Staple set rotary brushes is a staggered pattern, but there are also many applications that require either a straight pattern or spiral (helical) and chevron (herringbone) pattern. The staggered pattern is used for most common brushing needs. The straight pattern has more of a paddlewheel effect, which is ideal for flicking materials, while the spiral or herringbone patterns are better suited for orienting product in a specific direction.